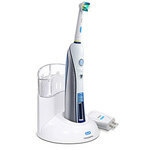 I have been using the Cybersonic Electric Toothbrush for over eight years now. I love this toothbrush! It has been long lasting, dependable, holds a charge well, and just keeps on working. It is very easy to use. Mine came with two chargers and brushes so the whole family could use it. We just pop off the toothbrush part off and put on another. Each brush comes in a different color so that you don't get confused on who used which brush. 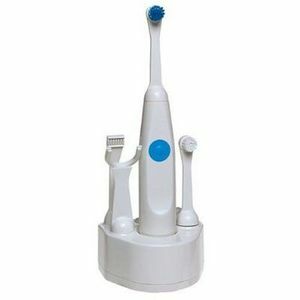 The electric toothbrush itself is very easy to turn on, with the press of a button. There are interchangable heads that can be used too. I have the tongue brush, the flosser and the toothbrush heads. They are easy to pop on and off. The battery holds its charge well, too. It works great every morning, brushing my teeth vigorously. I love how my teeth feel after I have brushed, it feels just like I have went to the dentist and had my teeth cleaned. This toothbrush is quality that will last and is worth every cent that I spent on it. They are even more affordable now than when I bought it eight years ago and the improvements have been great. The cybersonic is well worth the cost!! So I received this as a christmas gift one year. It looked a little too high tech for me,but I tried it out right away. 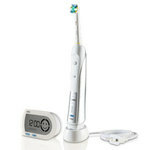 It was unlike any electic toothbrush that you would get out of kmart or walmart. This one really gets deep down and clean! It felt like I had just left the dentist when I was done brushing! And I literally haven't been to the dentist in years.It's so powerful it got all the built up plaque off that I had spent hours in the bathroom with a manual toothbrush trying to banish. I absolutely love it. My entire family wound up purchasing their own brushes after I told them how it was working for me! It's almost like you've barely scratched the surface with your manual brush! I usually don't believe what infomercials have to sell,so luckily I received this as a gift or I would have never known its value! Your wasting your time with a regular brush,the cybersonic beats them all!! CyberSonic3 does a great job and holds the charge. 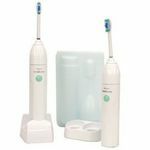 I have used the CyberSonic line of electric toothbrushes for 8 years. The newest one, CyberSonic3, I have been using now for just over one year. This toothbrush is amazing in how well it holds it's charge. It is nice to charge it and forget about it for weeks before putting it back in to charge it. They offer two different styles of brushes for the unit. You can also buy their dental floss pack that fits right onto the handle. Their tongue cleaner works great as well. It took me a while to get into the habit of using the tongue cleaner but it does a good job. CyberSonic also carries a cleaning gel that comes in a pump dispenser. I like using this as it really bubbles in between your teeth getting them clean. You can use a regular paste or gel toothpaste of your choice as well. The brush heads stay well attached to the unit and last for many months. This compact unit does not take up a lot of space on your counter top which is important for smaller bathrooms. It's easy to pack up if you need to travel. I will not go anywhere without mine. 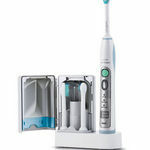 This is a really good product for helping keep your teeth clean and your gums refreshed, massaged and healthy. 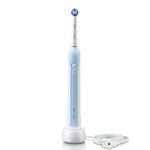 Brushing using the sonic electric toothbrush will make your gums healthy and bring back the pink natural color. I use to have like grey gums on my bottom and top front teeth but after months of using my sonic tooth brush my gums are a beautiful pink color. The sonic make thousands of passes on your teeth where as manual brushing you stop long before spending at least one minute on each quadrant of your mouth. You should brush at least twice per day using the sonic or any toothbrush. It would be best to brush after each meal. This is good practice using the sonic or manual brush. The sonic offers a much better clean and overall good health of your mouth. The next time you are in a store to purchase a toothbrush, reach for the sonic brushing system for a much healthier mouth.